Tri County Home Inspection is the preferred home inspection service in Lake Geneva, Wisconsin. 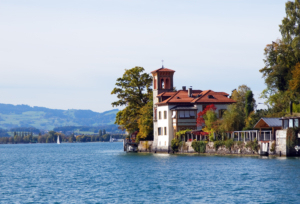 In fact, Lake Geneva residents make up 60% of our clients. We have detailed knowledge of the area, having completed hundreds of inspections in Williams Bay, Delavan, Burlington, Walworth, Fontana-on-Geneva Lake, Geneva, and everywhere in between. From small farm houses to 15,000 square foot vacation homes, we have experience in every size and type of house. Our certified home inspectors are ready with our 200% satisfaction guarantee when you want the best possible home inspection service in Lake Geneva. 5,000+ square feet. Have a look at our pricing to get an idea of your home inspection will cost. Please feel free to call us anytime for an exact pricing quote. We charge a little extra compared to our competitors because when we say “complete home inspection,” we mean it. Included with every inspection are RecallChek, SewerGard and MoldSafe protection services. You even get a 90-day home warranty and 5 Year Platinum Roof Protection for free with your inspection. Our number one compliment from our clients is “you are so much better than our last home inspector”. Tri County Home Inspection’s all-encompassing home inspection service in unparalleled in Southeastern Wisconsin, as well as being industry-leading. Many properties in Lake Geneva are situated on the lakefront. While lakefront properties are breathtakingly beautiful, there are some common issues with homes near the lake. Our Lake Geneva home inspectors are here to help you discover any potential problems before you completely commit to the new home. Mold and moisture issues: Being near a lake is bound to cause moisture problems in most homes. Moisture will lead to mold if left alone. Our inspectors will inform you of potentially moldy areas and already moldy areas. Structural foundation problems: The foundation of your home may have cracking or other structural issues caused by water damage or other geological problems. Improper drainage: If water isn’t flowing away from the home, basement flooding and foundation damage can occur. Homes near the water are already surrounded by damp soil, so it is important to make sure it is not infiltrating the home. Septic tank issues: Some lakefront homes have septic systems instead of a sewer line. It is incredibly important to have an inspector make sure it is in excellent working order and doesn’t have waste leaking into the ground or lake. You can be fined if there is waste leaking into the lake from your septic tank. No matter where you want to buy a home, an inspection is extremely important. You’ll be protected from unwanted surprises months after you move in. In addition to home inspections, we provide radon testing in Lake Geneva. While radon testing is not included with a home inspection, it is nonetheless an important part of a house’s professional examination. Radon is the second-leading cause of lung cancer deaths in Southeastern Wisconsin, behind only cigarette smoking. Please note Tri County Home Inspection only tests for radon – we do not provide radon mitigation, as it creates a conflict of interest. If you need radon mitigation, we recommend selecting a Wisconsin-approved radon mitigation contractor. Environmental testing is another service offered by our team of Certified Inspection Experts. A normal home inspection does not include a test for in-home pollutants like mold and asbestos. Environmental testing is worth the small fee, as discovering an in-home health hazard after closing may be expensive to fix. If there is a mold or moisture problem requiring correction, it should be indicated in the purchase price or be a condition that must be met by the buyer prior to closing. Therefore, you will want to know beforehand if such an issue exists in your future Lake Geneva home. Similarly, if your future house was built using Chinese drywall, it’s best to discover it beforehand. Have Tri County Home Inspection perform your environmental testing now to avoid costly remediation and repairs later. Tri County Home Inspection is a locally owned and operated home inspection company. We stand behind every inspection because we know we’re the best in the business. If you’re looking for superior home inspectors in Lake Geneva, look no further than the team at Tri County Home Inspection. Contact the environmental testing home inspectors in Lake Geneva at Tri County Home Inspection today, or call us at 262.225.9668 or 888.290.7646. We even have a 24-hour emergency line at 262.716.8997.